FORT COLLINS, Colo., May 9, 2016--On May 10 after months of indoor hibernation, painted pianos will emerge in outdoor locations across Fort Collins as part of the Pianos About Town project, a collaborative effort among Bohemian Foundation, the City of Fort Collins Art in Public Places program and the Fort Collins Downtown Development Authority. Over the course of the year, local artists will paint 13 pianos donated by community members. The Art in Action tent and summer painting will return to the south side of Fort Collins’ newly-renovated Old Town Square. The public is invited to stop by to watch the work in progress. On May 11, local artist Gail Whitman will be the first to start work on 2016 pianos. Since the program’s start in 2010, 40 local artists have been employed to paint 67 pianos. The original inspiration for Pianos About Town comes from British artist Luke Jerram, who created a 60-piano installation that toured the world, stopping in New York City in June 2010. Pianos About Town was also inspired by a similar project on Denver’s 16th Street Mall. The first pianos were placed in Downtown Fort Collins during the 2010 holiday season and were an instant hit. This is the sixth season for Pianos About Town. Pianos are acquired through donations made by community members looking for a new home for their used instruments. Pianos are picked up, free of charge, from their previous homes and brought to a storage area where they are cleaned, tuned, prepped for painting and readied for the outside elements. After that, the painting begins. Selected local artists spend approximately two weeks painting their piano in downtown Fort Collins, outdoors in a public location when weather permits. Once painted, each finished piano enters into rotation at Pianos About Town locations throughout Fort Collins. Area businesses play a key role in the success of the project by “adopting” the painted pianos and covering them during inclement weather. FORT COLLINS, Colo., May 3, 2016--- Bohemian Foundation today announced that it awarded $509,050 to 32 local nonprofits working to encourage and enable youth to thrive, empower individuals and families on the path toward economic stability and strengthen our vibrant Fort Collins community. Bohemian Foundation awards Pharos Fund grants twice every year. Since its inception in 2001, Bohemian Foundation Community Programs has awarded more than $15.5 million in Pharos Fund grants to a variety of nonprofits serving the Fort Collins area. Organization Name Bicycle Cooperative of Fort Collins, Inc.
Organization Name Homelessness Prevention Initiative, Inc.
Bohemian Foundation is a private family foundation established in 2001. Based in Fort Collins, Colo., Bohemian Foundation works to empower citizens and impact communities through its responsive grant making programs and special initiatives..
FORT COLLINS, Colo., March 21, 2016 - Fort Collins’ annual Project Homeless Connect is scheduled to take place on April 8, 8 a.m.-noon. Project Homeless Connect is a one-day, one-stop event on that offers a range of free services to hundreds of people who are experiencing homelessness or at risk of homelessness. Project Homeless Connect will take place at the Northside Aztlan Center, 112 Willow St. A free breakfast will be available in the morning, and a free BBQ lunch will be served from 11 a.m.-1 p.m. Nearly 60 local nonprofits, government agencies and businesses will provide on-site services. Homeward 2020, Bohemian Foundation, the Murphy Center and Colorado State University Student Leadership, Involvement and Community Engagement (SLiCE) co-produce the event with support from United Way of Larimer County. During the event, each participant is paired one-to-one with a volunteer who helps the participant navigate the variety of services available. Last year, SLiCE recruited more than 400 CSU students and Fort Collins community members to volunteer. Governing roles and responsibilities for executive directors and board members. Clear roles, expectations and commitments of board and staff in organizational leadership. Various hats board members wear and when they should be worn. Managing effective meetings and communications. Strategies for effective recruitment and retention of boards. This workshop is for executive directors and board members of local nonprofits. Wednesday, Jan. 20, 2016. 1:30-4:30 p.m. The Armory, 314 E. Mountain Ave.
Board service is a critical component of nonprofit leadership and organizational success; however, expectations and best practices are often unclear. This session will provide information about best practices and strategies to create and sustain great governance between the board of directors and executive director. Visitwww.bohemianfoundation.org/board-training to learn more or to register to attend this workshop. Space is limited, please RSVP no later than Jan. 13. There is no cost to attend. Davis is president of Emily Davis Consulting and a BoardSource Consulting Associate. She has served as a nonprofit founder, philanthropic grant maker, staff member and volunteer across a wide variety of organizations locally and nationally. She has authored publications in magazines including Nonprofit World, AFP’s Advancing Philanthropy and BoardSource’s Spark among others. She has her master’s degree in nonprofit management from Regis University and serves as an adjunct professor in that program. Davis was recently named one of the 2015 40 Under Forty Young Business Leaders in Boulder Valley by BizWest. Bohemian Foundation is pleased to announce that the Pharos Fund is now accepting applications for the Spring 2016 grant round. The Pharos Fund is a responsive grant making initiative of Bohemian Foundation’s Community Programs. Community Programs goals were recently updated and expanded, so organizations that may not have been previously eligible are encouraged to review the fund’s updated guidelines. Pharos Fund is pleased to announce that it is now accepting applications from both 501(c)(3) organizations and eligible governmental units serving a charitable purpose. Applicants must provide services within the Poudre School District boundary. Applicants do not need to be headquartered in Fort Collins to receive funding. However, applicants must serve clients within the Poudre School District boundary or have a direct impact on individuals in our grantmaking area. Bohemian Foundation will accept applications until 11:59 p.m. on Feb. 4. Bohemian Foundation today announced that it awarded $500,500 to 33 local nonprofits working to encourage and enable youth to thrive, empower individuals and families on the path toward economic stability and strengthen our vibrant Fort Collins community. Bohemian Foundation awards Pharos Fund grants twice every year. Today’s announcement brings the foundation’s Pharos Fund awards to a total of $1,008,980 in 2015. Since its inception in 2001, Bohemian Foundation Community Programs has awarded more than $15 million in Pharos Fund grants to a variety of nonprofits serving the Fort Collins area. Pharos Fund is a responsive grant making initiative of Bohemian Foundation that makes awards up to $30,000 to eligible 501(c)(3) nonprofit organizations and governmental units. A committee comprised of Bohemian Foundation board members, Bohemian staff and community members selects grantees through a competitive application process. A total of $500,500 was awarded to 33 organizations. Organization NameColorado Health Network, Inc.
Organization NameFaith Family Hospitality of Fort Collins, Inc.
Organization NameJunior Achievement - Rocky Mountain, Inc.
Organization NameNeighbor to Neighbor, Inc.
Bohemian Foundation will begin accepting applications for the next Pharos Fund round starting Jan. 5, 2016. With recently expanded Community Programs goals, the foundation is encouraging nonprofits and governmental units to review the updated Pharos Fund guidelines to learn more. Visit BohemianFoundation.org for more information. Fort Collins’ Sister Mary Alice Murphy Center will open at 8 a.m. Dec. 7 under new management and ownership. The Murphy Center will continue to fulfill its original mission of serving people who are homeless and near homeless. The four organizations that will assume day-to-day operations of the center are Homeless Gear, which is the organization that will serve as the center’s managing partner; Catholic Charities; Neighbor to Neighbor; and SummitStone Health Partners. Murphy Center LLC will become the building owner. Bohemian Foundation will provide support to the Murphy Center LLC for building costs. SERVE 6.8, the manager of the Murphy Center since 2013, stepped out of its role at the Murphy Center at the close of the day on Dec. 4. SERVE 6.8 took responsibility for operations at the center in July of 2013. The group of community partners and SERVE 6.8 have worked together to provide uninterrupted services to Murphy Center guests during this transition. The group of community partners will maintain the Murphy Center as a space in which multiple agencies can provide a continuum of services to individuals and families who are homeless or near homeless. Fort Collins nonprofit SERVE 6.8 today announced that it plans to transfer ownership and management of the Sister Mary Alice Murphy Center for Hope to a coalition of community partners in December of this year. Under this new ownership and management, the Sister Mary Alice Murphy Center for Hope, commonly known as the Murphy Center, will continue to fulfill its mission of serving people who are homeless in Larimer County. The coalition of community partners includes four local organizations that will assume day-to-day operations of the Murphy Center, and Bohemian Foundation, which will become the building owner. The four organizations that will assume day-to-day operations are Homeless Gear, which is the organization that will serve as the center’s managing partner; Catholic Charities; Neighbor to Neighbor; and SummitStone Health Partners. Homeward 2020 will serve as the Murphy Center Stakeholder Council to provide guidance on the community’s homeless response system. SERVE 6.8, the manager of the Murphy Center since 2013, remains committed to addressing homelessness in Fort Collins, but plans to focus future efforts on preventative strategies, which include operation of the new SERVE 6.8 Resource Center at 1600 E. Mulberry St. The coalition of community partners and SERVE 6.8 are working together to ensure a smooth transition aimed at providing uninterrupted services to guests at the Murphy Center. The group plans to complete the center’s transition to new management on Dec. 7. Since taking over the Murphy Center in July of 2013, SERVE 6.8 has facilitated 79,424 visits at the center. The new coalition of community partners will maintain the Murphy Center as a space in which multiple agencies can collectively and collaboratively provide a continuum of services to individuals who are homeless or at-risk of homelessness. The agencies will work closely together to ensure that services are coordinated and delivered in accordance with best practices. United Way of Larimer County, an organization firmly committed to supporting people who are homeless through services provided at the Murphy Center, is helping to facilitate a smooth transition to the new operating and ownership partners. United Way and a number of foundations, churches and individual donors provide funding for the Murphy Center. Named in honor of Sister Mary Alice Murphy, a Larimer County pioneer of service to neighbors in need, the Sister Mary Alice Murphy Center for Hope celebrates compassionate action and serves as a resource center for families and individuals who face homelessness. The Murphy Center opened in 2009 and has proven to be a model for community collaboration and an essential resource in Larimer County. More information is available at www.murphycenterforhope.org. SERVE 6.8 is a non-profit, 501(c)(3) organization that creates significant and sustainable change in northern Colorado by expanding and enhancing the impact of community and faith based organizations and by maximizing the full potential of compassion-driven organizations. More information is available at www.serve68.org. Bohemian Foundation is a private family foundation established in 2001. Based in Fort Collins, Colo., Bohemian Foundation works to empower citizens and impact communities through its responsive grant making programs and special initiatives. More information is available at www.bohemianfoundation.org. Homeless Gear operates a family of six programs that provides a continuum of services to individuals and families who are homeless: supplies that help them survive in the short-term, connections to resources in the interim and links to employment, housing and self-sufficiency in the long-term. Catholic Charities of the Archdiocese of Denver has been serving the Northern Colorado community since 1983. We serve thousands of people each year in three areas: Shelter Services, Senior Services and Emergency Services. Catholic Charities is open to, and serves, all people. We collaborate with Catholic parishes and local churches, local businesses, nonprofit organizations, government agencies, medical facilities and educational institutions. Our shelters provide short- and long-term housing and supportive services with the objective of helping people become self-reliant. Neighbor to Neighbor (N2N) is a 501 (c) (3) non-profit organization serving as a primary housing resource for Larimer County residents since 1970, with services from homelessness to homeownership. N2N has operated its Fort Collins Renter Program at the Murphy Center since 2009. N2N’s Renter Program offers the following services: Emergency Rent Assistance, First Month’s Rent Assistance and Housing Search Assistance. N2N impacts over 5,000 individuals each year. SummitStone Health Partners is a private non-profit whose mission is to provide unsurpassed behavioral health prevention, intervention and treatment services in Larimer County. With 23 locations throughout Larimer County, SummitStone Health Partners provides mental health and substance abuse treatment that center on improving the lives of people served by building healthier individuals and families. Over 50 products and services allow SummitStone Health Partners to meet the individualized needs of consumers and their families through evidence-based and consumer-focused care. For more information, please visit www.summitstonehealth.org. More than 225 Larimer County middle and high school students and 30 local nonprofits will gather on Oct. 2 to kick off their participation in Give Next, a year-long program designed to teach students about giving and the important roles nonprofits play in our community. The Oct. 2 Give Next event, called Philanthropy Day, will include speakers, a nonprofit fair, a nonprofit career panel and workshops led by nonprofit staff. The event will provide students with information about community issues and nonprofits, and about ways they can contribute to their community. After Philanthropy Day, participating students launch into a year-long curriculum through Give Next. Give Next is a school-based youth philanthropy program that offers middle and high school students experience with the power of teamwork, the impact they can have on their community and the rewards of giving. Through the program, local businesses, foundations and individuals become classroom donors by providing each participating school in the Poudre and Thompson Valley School Districts with $5,000 to award to Larimer County nonprofits. With the financial support of these donors, students design and manage their own grantmaking programs. Students work together to identify community needs, choose a focus area, create their own mission statement, research nonprofits, volunteer, conduct site visits, review grant applications and make funding decisions. Students also can create and manage their own fundraising campaigns to add to the original $5,000. At the end of the school year, students award grants to selected nonprofits. Give Next is a partnership of community volunteers and organizations that include Bohemian Foundation, the Community Foundation of Northern Colorado, Poudre School District, Thompson School District and the Give Next Advisory Committee. To learn more about Give Next, visit bohemianfoundation.org/community-programs/give-next. Note to editors: Reporters are welcome to attend Philanthropy Day. To attend, please call June Greist at 970-481-4361. The event will run 9:30 a.m.-1:15 p.m. Oct. 2 at Timberline Church, 2908 S. Timberline Road, Fort Collins. The Fort Collins Downtown Development Authority today announced that Bohemian Foundation provided a $200,000 grant to support a new entertainment stage in the city’s Old Town Square. The new stage is part of a broader renovation project that is slated for completion in October. The stage, which anchors the north side of the Old Town Square plaza, replaces a smaller stage constructed in 1984. The stage design evolved as a result of collaborative input from many long-time Old Town Square users, including event producers, performers, production technicians and audience members. The new stage will accommodate a broad variety of performance styles and event sizes. When not in use for performances, the stage will be available as a casual seating area for downtown visitors. Construction crews installed a steel canopy over the stage in late August; the remaining equipment will be installed over the next several weeks. Bohemian Foundation’s Music Programs produces many free community concerts that are held in Old Town Square. These concerts are among the dozens of special events and programs Old Town Square hosts each year. 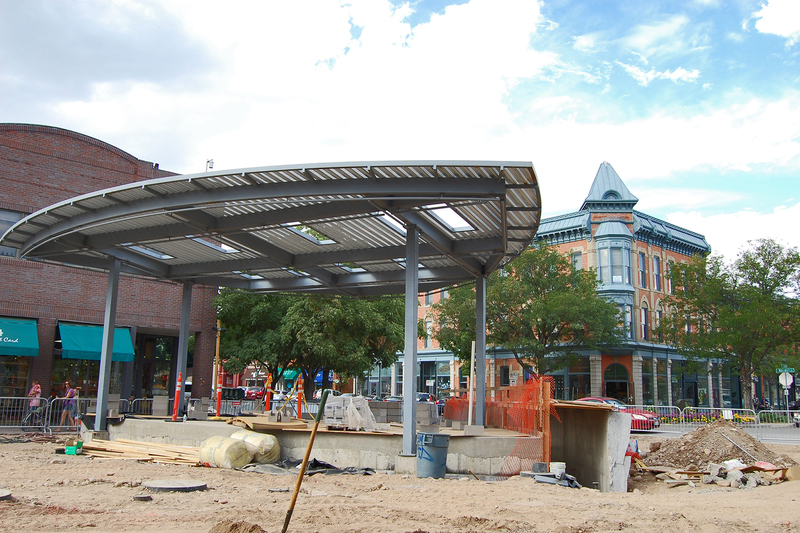 The Old Town Square renovation project is in its last six weeks of construction. Details regarding a reopening celebration will be announced by mid September. As part of the vibrant Downtown experience, the public plaza portion of Old Town Square has been heavily used over the last 30 years. The DDA and its project staff are committed to creating a high-quality, public gathering space that accommodates a variety of activities now and into the future. Construction is underway and will be complete this fall. The mission of the Fort Collins Downtown Development Authority is to build public and private partnerships that advance economic, cultural and social growth in the Fort Collins central business district. Bohemian Foundation is a private family foundation established in 2001. Based in Fort Collins, Colo., Bohemian Foundation works to empower citizens and impact communities through its strategic grant making programs and special initiatives.